Fa-hien returned (from here) towards Pataliputtra,keeping along the course of the Ganges and descending in the direction of the west. 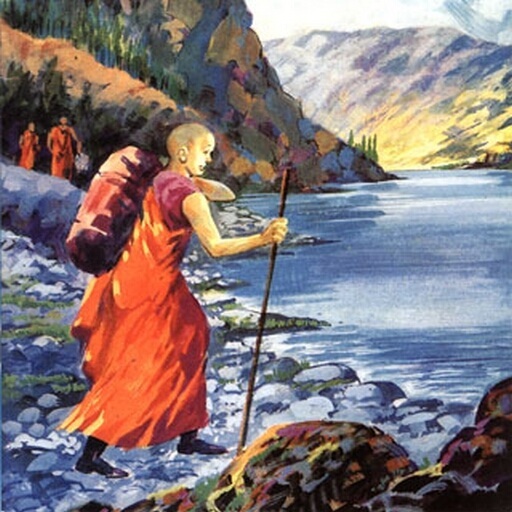 After going ten yojanas he found a vihara, named “The Wilderness,”— a place where Buddha had dwelt, and where there are monks now. Pursuing the same course, and going still to the west, he arrived, after twelve yojanas, at the city of Varanasi in the kingdom of Kasi. Rather more than ten le to the north-east of the city, he found the vihara in the park of “The rishi’s Deer-wild.”In this park there formerly resided a Pratyeka Buddha, with whom the deer were regularly in the habit of stopping for the night. When the World-honoured one was about to attain to perfect Wisdom, the devas sang in the sky, “The son of king Suddhodana, having quitted his family and studied the Path (of Wisdom), will now in seven days become Buddha.” The Pratyeka Buddha heard their words, and immediately attained to nirvana; and hence this place was named “The Park of the rishi’s Deer-wild.” After the World-honoured one had attained to perfect Wisdom, men build the vihara in it. Buddha wished to convert Kaundinya and his four companions; but they, (being aware of his intention), said to one another, “This Sramana Gotama for six years continued in the practice of painful austerities, eating daily (only) a single hemp-seed, and one grain of rice, without attaining to the Path (of Wisdom); how much less will he do so now that he has entered (again) among men, and is giving the reins to (the indulgence of) his body, his speech, and his thoughts! What has he to do with the Path (of Wisdom)? To-day, when he comes to us, let us be on our guard not to speak with him.” At the places where the five men all rose up, and respectfully saluted (Buddha), when he came to them; where, sixty paces north from this, he sat with his face to the east, and first turned the wheel of the Law, converting Kaundinya and the four others; where, twenty paces further to the north, he delivered his prophecy concerning Maitreya; and where, at a distance of fifty paces to the south, the dragon Elapattra asked him, “When shall I get free from this naga body?”— at all these places topes were reared, and are still existing. In (the park) there are two monasteries, in both of which there are monks residing. When you go north-west from the vihara of the Deer-wild park for thirteen yojanas, there is a kingdom named Kausambi. Its vihara is named Ghchiravanao — a place where Buddha formerly resided. Now, as of old, there is a company of monks there, most of whom are students of the hinayana. East from (this), when you have travelled eight yojanas, is the place where Buddha converted the evil demon. There, and where he walked (in meditation) and sat at the place which was his regular abode, there have been topes erected. There is also a monastery, which may contain more than a hundred monks.